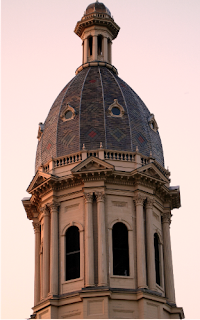 Despite the best efforts of workmen in 1885, and later, the cupola has been continued to shift torsionally, essentially twisting under its own weight. Though the shift has been relatively minimal, it nonetheless remains noticeable to this day, and the tower sits slightly askew relative to the main building below. Old Colony Memorial, January 24, 1885, p. 4; March 12, 1885, p. 4.